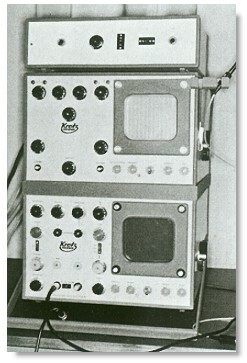 The model 7100 MA combined A- and B- scan for ophthalmology from Kretztechnik, mid-1960s. 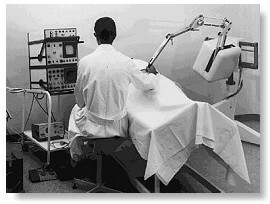 A similar console and design (right) was used for abdominal scans (below). 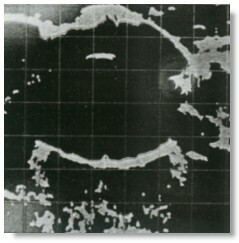 The scanner was designed by Dr. Ossoning in Austria in collaboration with Kretztechnik. The 7200 MA went into serial production in 1970; it was the only A-scan instrument available for standardized ophthalmologic echography throughout in the 1970s and early 1980s. About 500 of these units were put into use by 1980 worldwide. 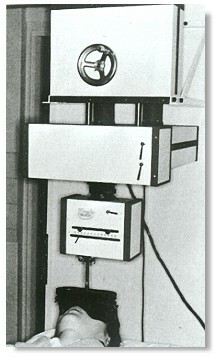 These scanners were very popular in Europe and were used by other pioneers such as A. Oksala in Finland and G. Bellone in Italy. Some of these units are still in use today. B-mode scan of the eye at around 20MHz (left) and abdominal scanner from KretzTechnik® (the 4100 MGB, right), which has similar configurations to the ophthalmologic machine.